Abstract: The standard flavour is the 915P, but as you guessed it, the 915G boasts its own Intel GMA900 integrated video package. When 8X AGP videocards were first introduced, the big question on a lot of people's minds was, 'why?' After all, 4X AGP videocards didn't even take full advantage of the bandwidth or features available to them. At the time, moving to 8X AGP from 4X AGP all seemed a bit redundant, and the change marketing-department driven. Right now, as the computer industry is faced with the change from 8X AGP to PCI Express x16 videocards, the same questions are popping up, and consumers are wondering why they should switch to yet another interface when there really is no need at the moment. The simple reason is this, Intel and co. are addressing issues proactively. This is why the socket 775 Pentium4 (care of the 915P and 925X chipsets, although there are exceptions ) only works with PCI Express videocards. Intel undoubtedly realize that if nothing is done to move consumers over to a higher-bandwidth graphics card interface, big bottlenecks will eventually appear. It's much easier to deal with these issues before hand, rather than later on with a knee-jerk reaction. 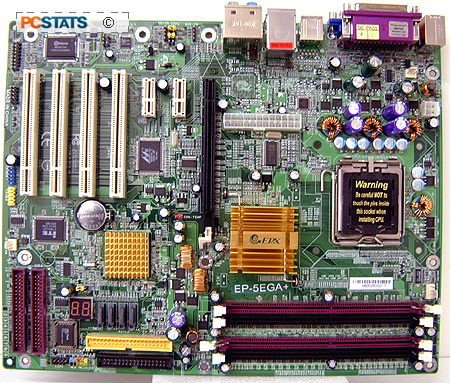 Keep all that in mind as PCstats tests out the brand-spanking-new Epox EP-5EGA+ motherboard. The EP-5EGA+ is a next generation board which is based on the new Intel 915G and ICH6R chipsets. The standard flavour is the 915P, but as you guessed it, the 915G boasts its own Intel GMA900 integrated video package. It also comes with the high bandwidth PCI Express x16 slot for graphics cards, so there are couple options video-wise. If your computing requirements include high bandwidth peripherals like SCSI controllers or standalone Gigabit Ethernet NICs, there are two PCI Express x1 slots that have an amazing 250MB/s worth of bandwidth just waiting to be tapped! That is almost twice the regular PCI bus bandwidth! Of course, there are still four PCI v2.3 slots for your legacy devices, like sound cards, wireless LAN cards, or what have you. The rear I/O headers of the Epox 5EGA+ are quite different from the typical layout, so it's a good thing this board comes with its own I/O shield. Adjacent to the video connector are an optical and RCA SPDIF out port. On the opposite side are four of the USB2.0 ports, the Gigabit NIC and 7.1-channel 'auto jack sensing' audio mini-headphone jacks. 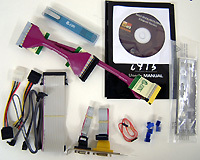 The game and serial ports are located on a separate bracket which plugs into the motherboard.